This page has some sample patterns - at the bottom of the page, I also have some things to think about when designing your quilt. These are ideas for quilt patterns. Remember these are general sizes. The actual size varies depending on the size of each block and the number of borders and the size of the borders put in each quilt. 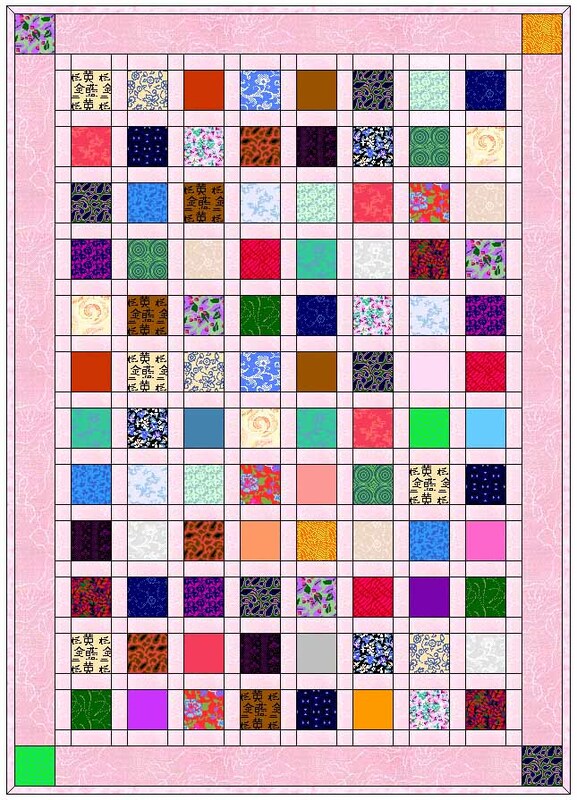 The prices shown are for one border and basic meandering on the quilting. Additional costs apply for additional borders, appliqué work, and more intricate quilting designs. 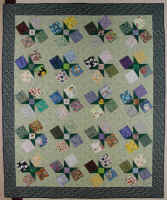 Pinwheel Quilt -- This pattern works well for a 100 Good Wishes Quilt. The 100 different fabrics are randomly placed in each of the four pinwheel areas, and also a smaller print is used in the center square of each pinwheel. 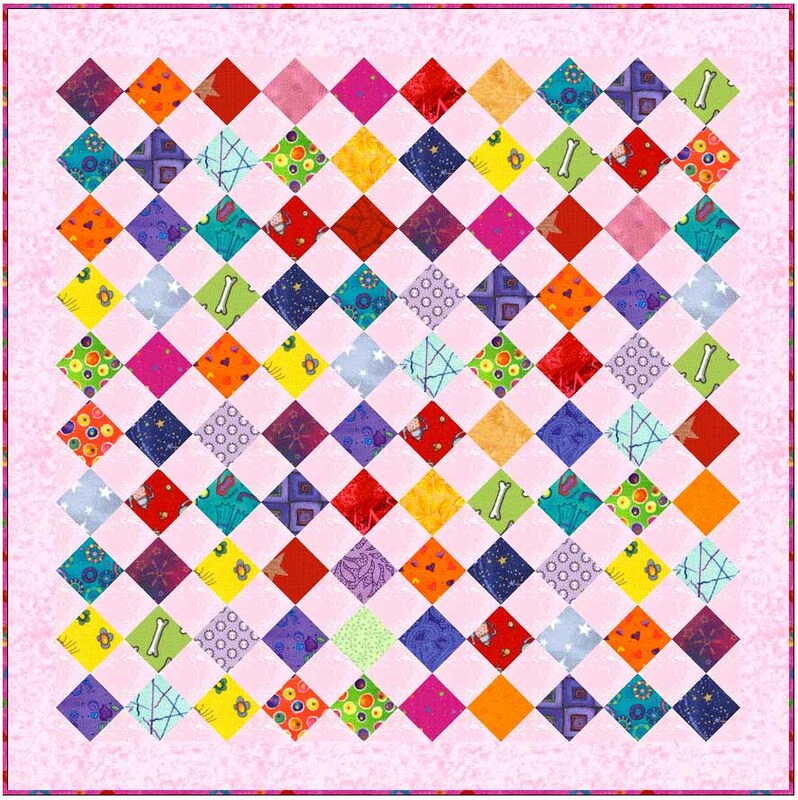 This pattern also allows for additional appliqué work or fun quilting between where each of the squares are sewn together. This quilt measures approx 56 x 70 without the borders. A larger size can be achieved by adding borders. The price for labor on this quilt is $600. Additional fabrics needed: border fabric if wanted, background fabric (shown here in pink), pinwheel fabric (shown here in black), binding fabric (probably the same fabric as the pinwheel fabric), and fabric for the back of the quilt. The top photo is a computer generated, the bottom photo is an actual quilt. This pattern looks much like the Pinwheel pattern, but has a small change. It works well for a 100 Good Wishes Quilt. The 100 different fabrics are randomly placed in each of the four pinwheels. Pricing depends on the number of blocks and the size of the quilt. Closed Pinwheel -- This pattern works well for a 100 Good Wishes Quilt. The 100 different fabrics are randomly placed in each of the four pinwheels. This is similar to the pinwheel shown above, however the center square is missing. Assuming each block is 6" this quilt will measure 61 x 61 without the borders. This price for labor only on this quilt is $600. 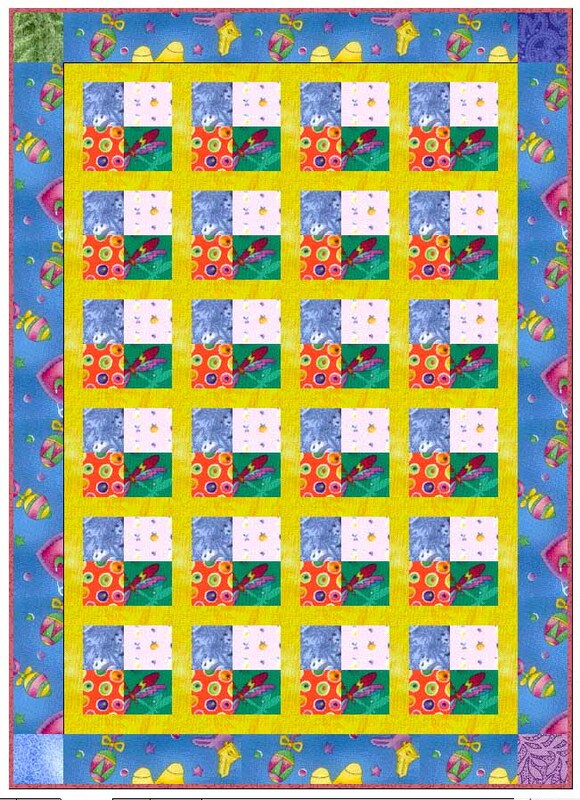 Sashing Twin Size -- This pattern works well for a 100 Good Wishes Quilt. The 100 fabrics are placed 8 across and 12 down with one in each corner. This quilt has a finished size of approximately 65 x 97". It has 1.5" sashings between fabric, and a 5" border. The squares are each 5" x 5" in size. The price for labor on this quilt is $500. 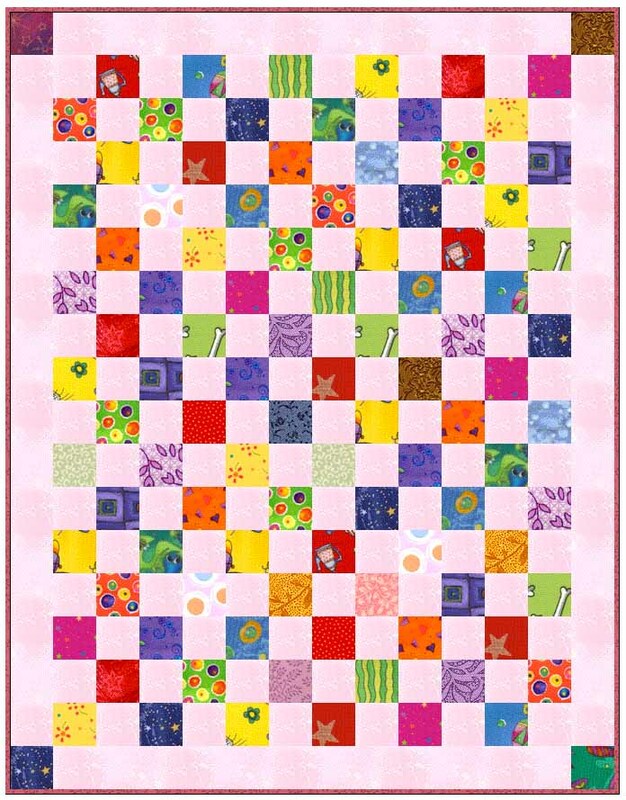 This quilt is very cute using flannel as the sashing and chenille on the borders. You can locate chenille if you follow the link from the links page to Chenille Magic. 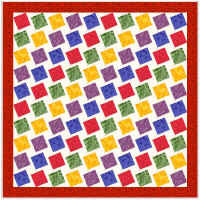 Sashing Square -- This is very much like the twin size but this is square with 10 squares across and 10 down. 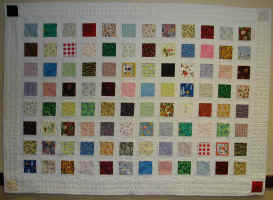 It measures approx 71" x 71" depending on the size of the blocks and the sashing. The price for labor on this quilt is $500. This pattern is much like a checkerboard. It is designed as a 100 Good Wishes Quilt - there are 100 fabrics shown here. You pick the background and the border. 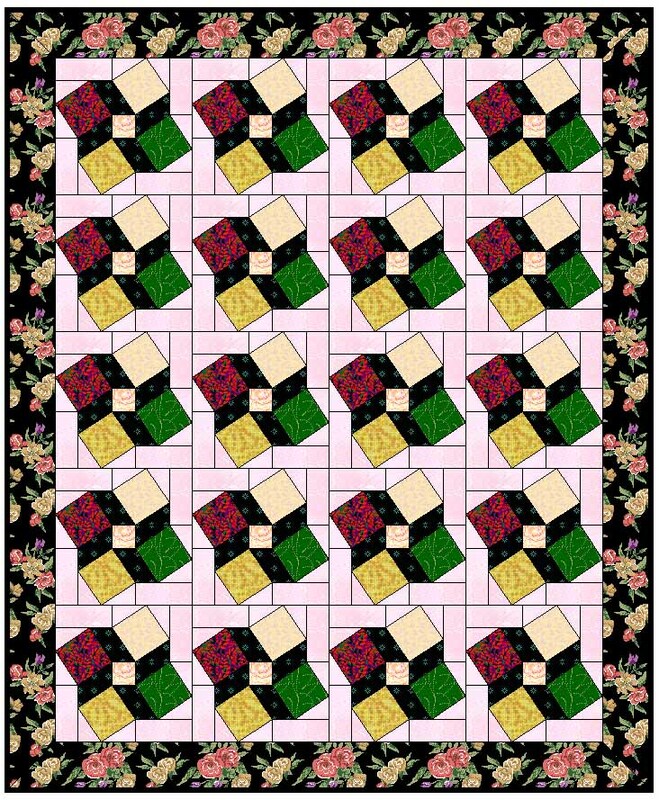 If using 5" squares, this quilt would measure approximately 71" x 91". The price for labor is $500. This a checkerboard pattern on point, and too was designed as a 100 Good Wishes Quilt. 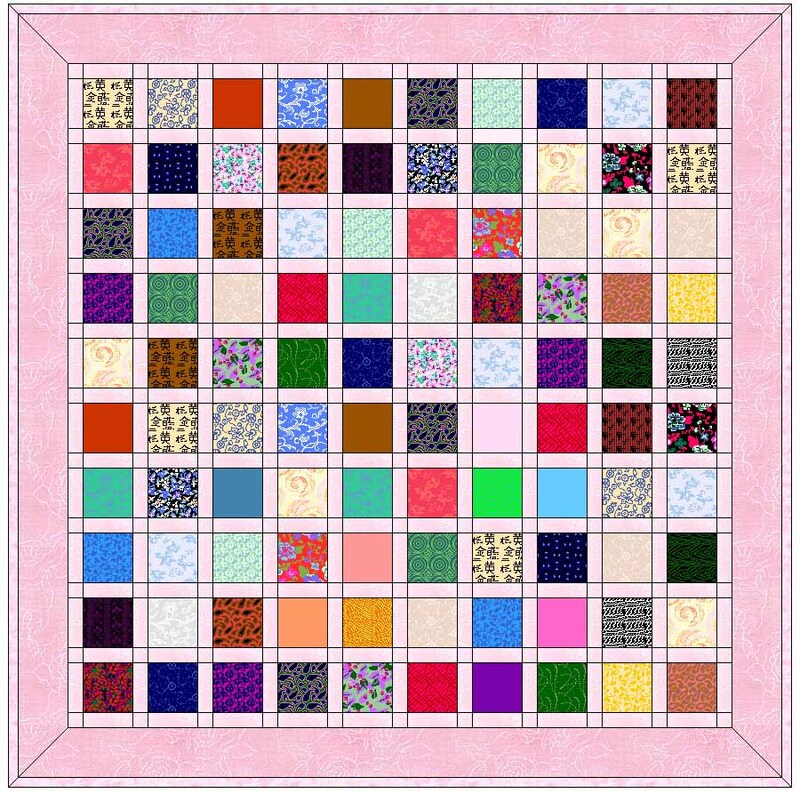 Using 5" squares and a 5" border this measures approx 82" x 82". The price for labor is $525. 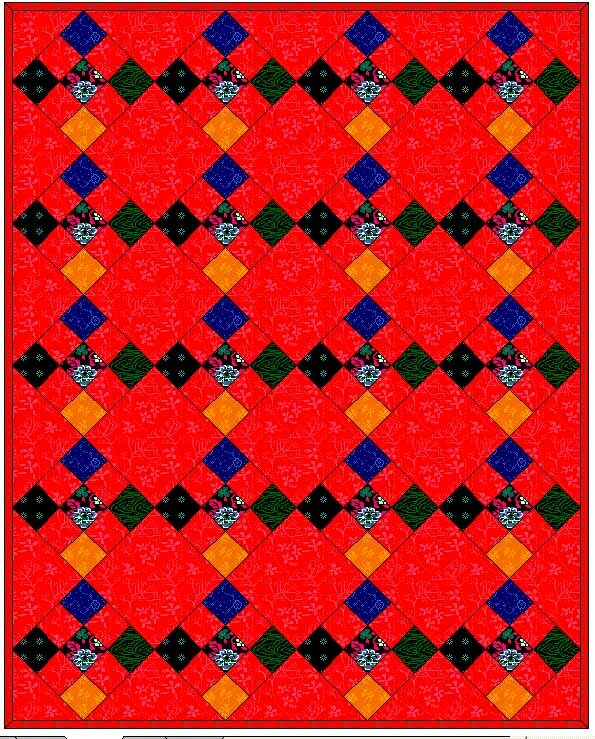 First concept: Using the 5" squares, and a 2" sashing and a 5" border this quilt measures approximately 68" x 68". The price for labor is $500. Second concept: This is also using 5" squares, 2" sashing, and a 5" border but it arranges the 100 blocks of fabrics a bit different. Notice the blocks in each corner too. 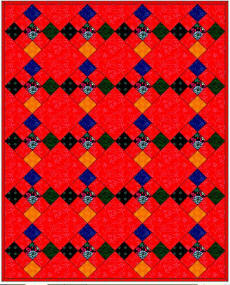 This quilt measures approximately 57" x 79". The price for labor is $500. Scattered Block 1 -- This pattern works well for a 100 Good Wishes Quilt. The 100 different fabrics are randomly placed in each of the places where the colors are. You'd need to pick out a background fabric and a border fabric for this quilt, or I can help you. This quilt measures approx 51" x 51". The price for labor only on this quilt is $550. Scattered Block 2 -- This pattern works well for a 100 Good Wishes Quilt. The 100 different fabrics are randomly placed in each of the places where the colors are. You'd need to pick out a background fabric and a border fabric for this quilt, or I can help you. This quilt measures approx 51" x 51". The price for labor only on this quilt is $550. 9 patch (On point) -- The 100 different fabrics are randomly placed in each of the places where the colors are. You'd need to pick out a background fabric and a border fabric for this quilt, or I can help you. Each of the smaller fabrics finish at 4" x 4", so this is a good size for a Good Wishes Quilt. With a border it would finish at approx 75" x 88". The price for labor only on this quilt is $500. 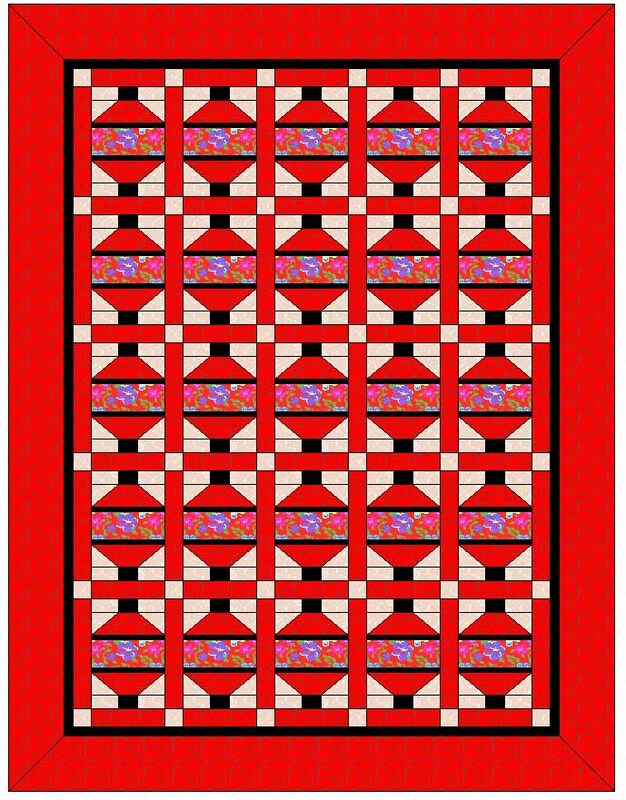 This pattern would be darling for a 100 Good Wishes Cuddle quilt using Asian fabrics for the pagoda. The lighter fabrics could be the background of the block. This pattern would be darling for a 100 Good Wishes Cuddle quilt. The lighter fabrics could be the background of the block, and the bolder fabrics could be the back of the ladybug. 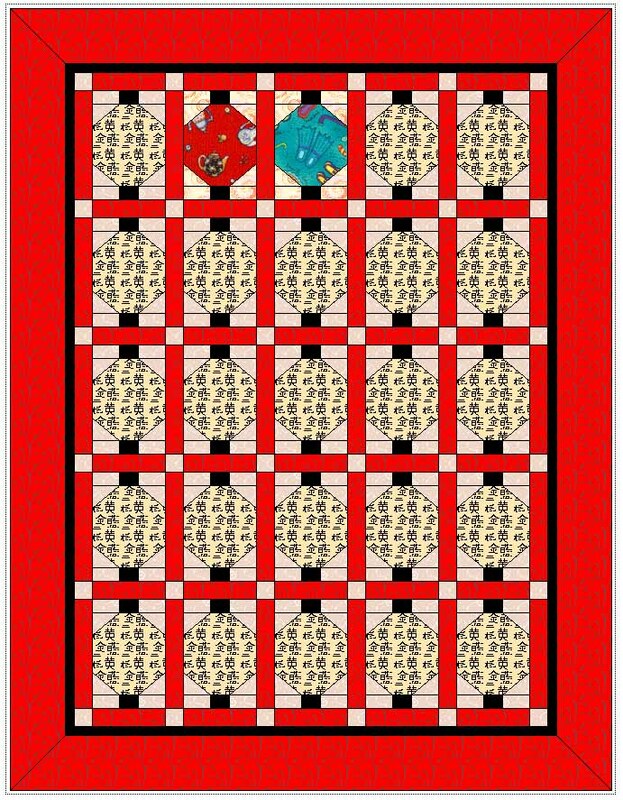 Click on the quilt to enlarge and see the first two ladybugs to see how this could work. 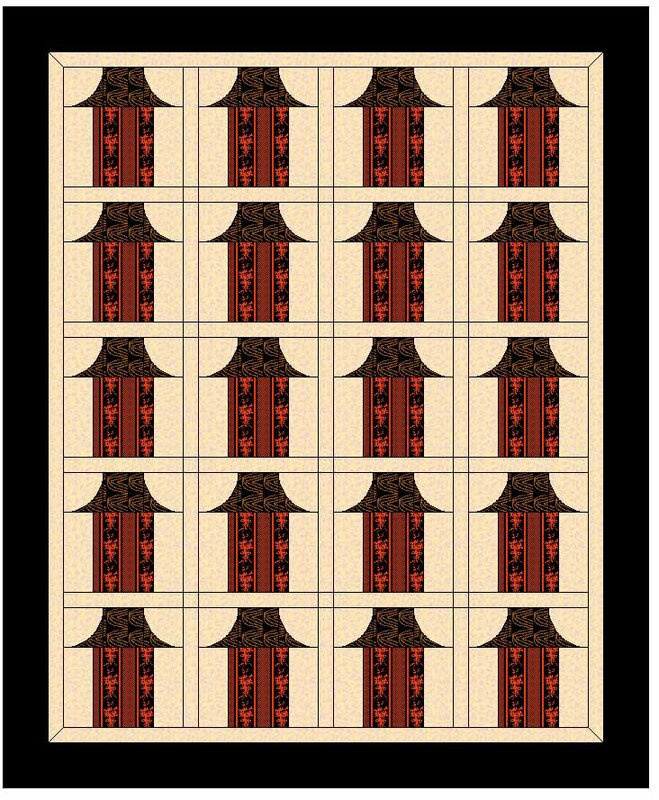 This pattern works well for a 100 Good Wishes Quilt. The 100 different fabrics are placed in each of the lantern areas. 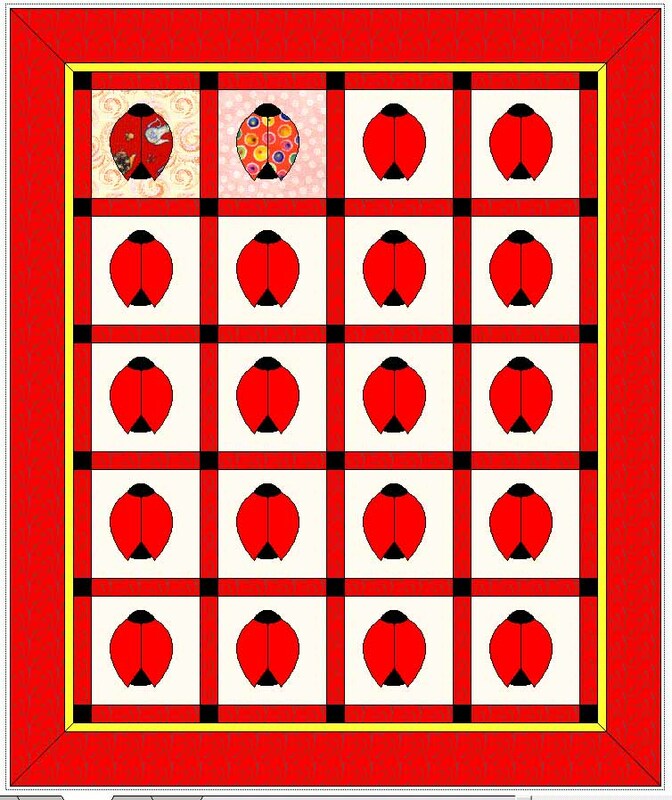 Click on the quilt to the left and see the different lanterns on the top row. Each lantern would be different in the quilt. Size depends on how many blocks you have and how large you'd like each block. This pattern is the popular snowball pattern. Size depends on how many blocks you have and how large you'd like each block. This is the popular shooting star pattern. Size depends on how many blocks you have and how large you'd like each block. 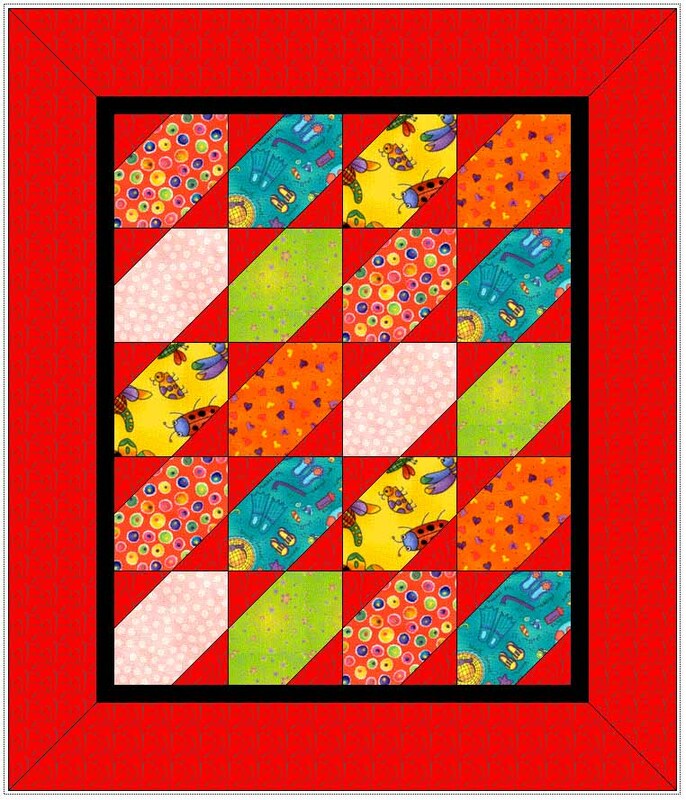 Crazy Quilt -- This quilt pattern is great for a child's quilt. 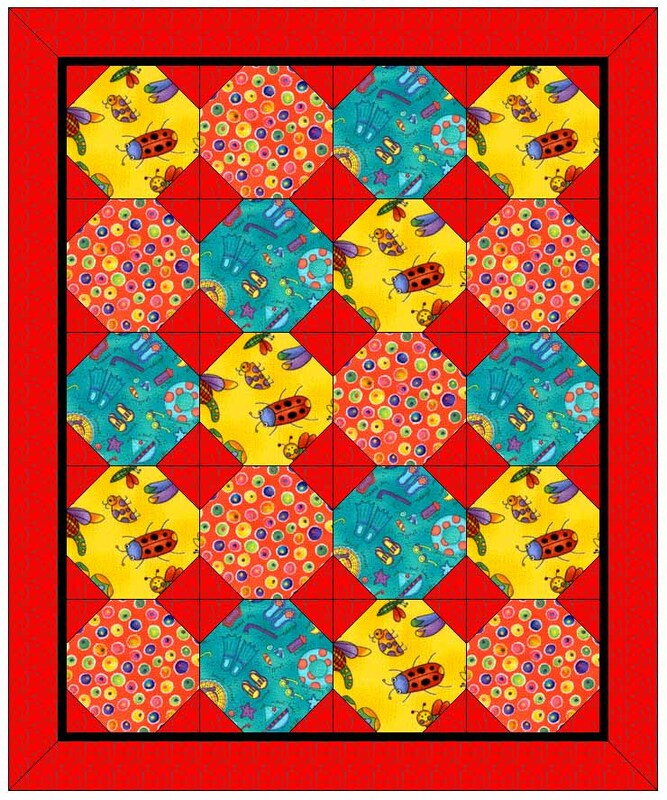 I like using fun kids fabrics to create a quilt that any kid would enjoy! 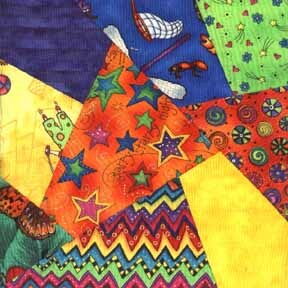 Here is one square of the kids crazy quilt. 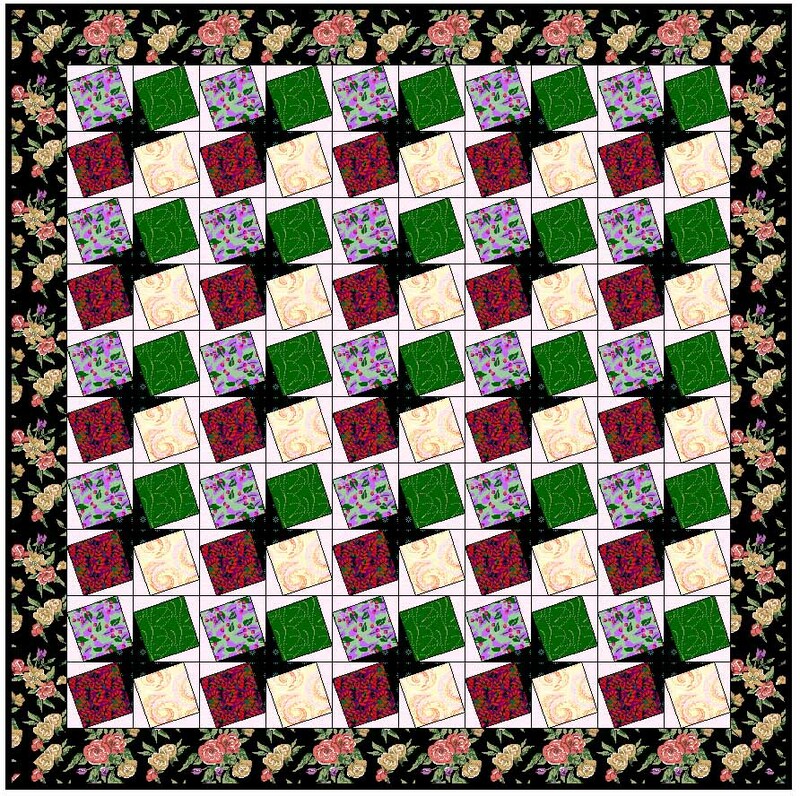 There are nine fabrics in this square, and the construction method uses nine fabrics to create nine different squares. 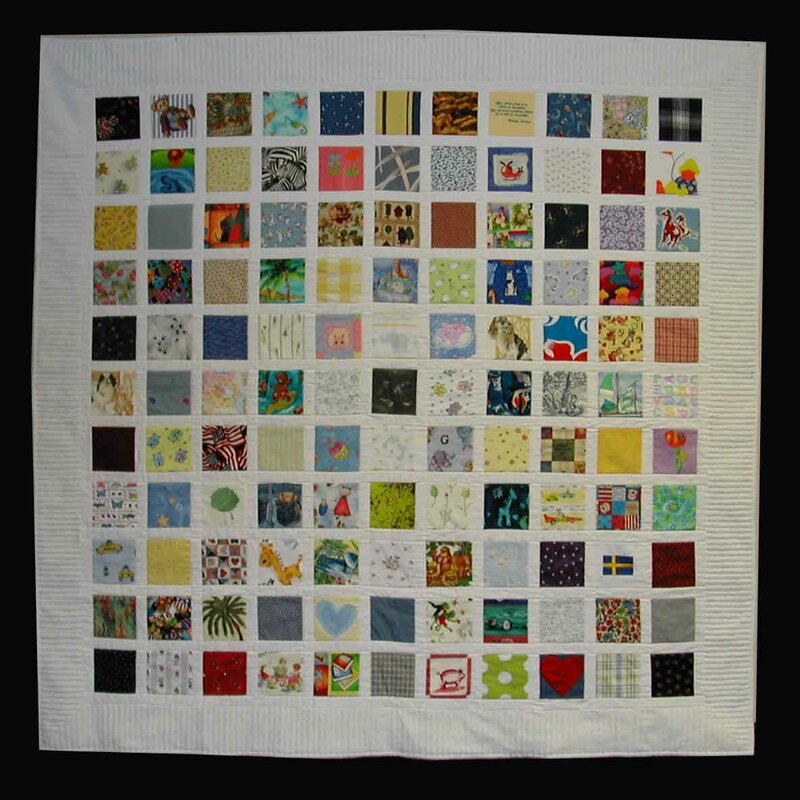 You are not limited to just nine fabrics if you are making a bigger quilt for a child's bed. Here are four squares put together with a boarder between them. 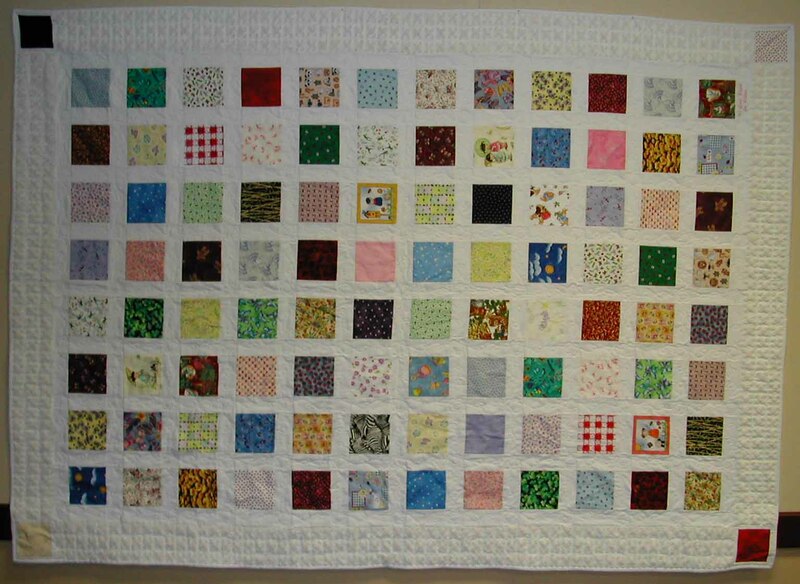 A picture of a full quilt like this is in the gallery. Pricing would depend on the size of the finished quilt. 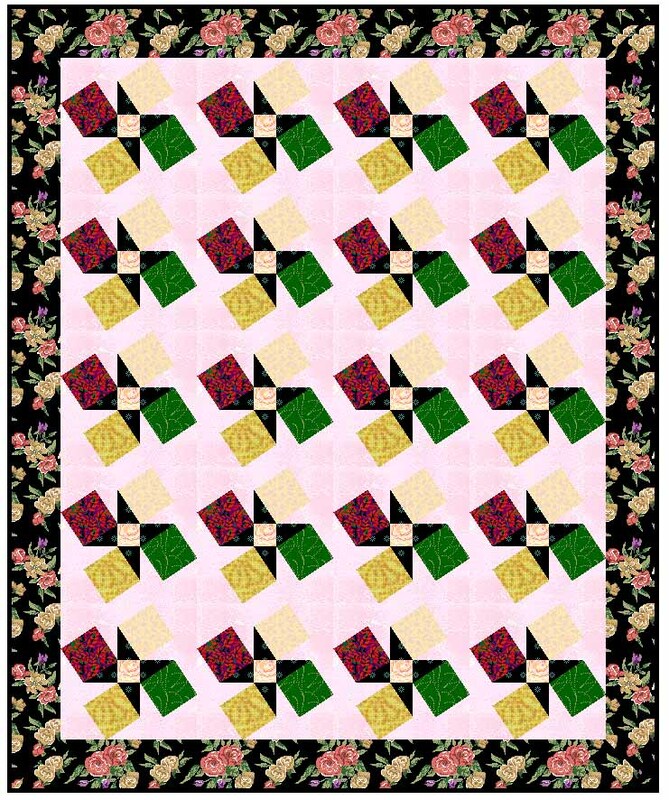 This page shows some quilt patterns. We are able to make most all designs if you have others in mind. This page is to give you ideas. How will you use this quilt? 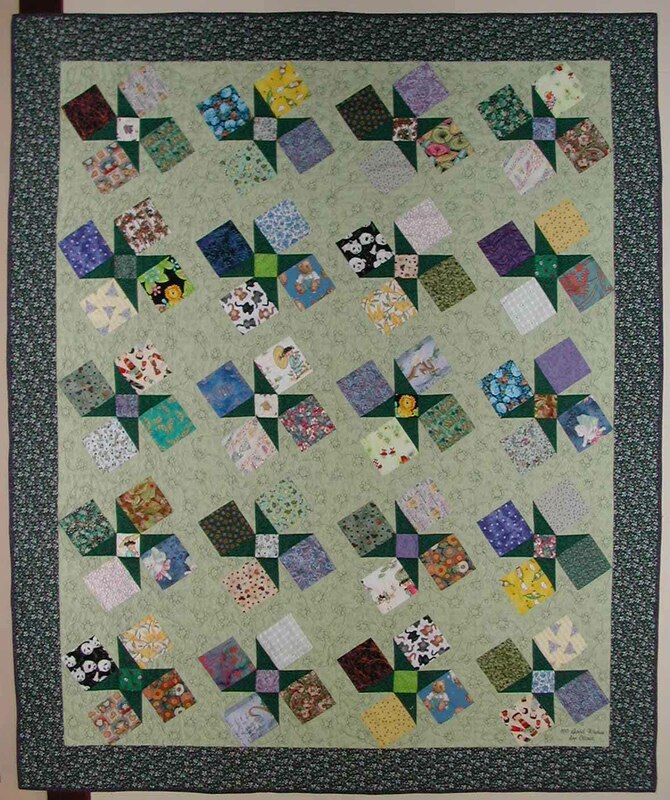 Will it be a usable quilt (washed often) or will it be an Heirloom (passed from generation to generation) quilt? What pattern would you like the quilt to have? 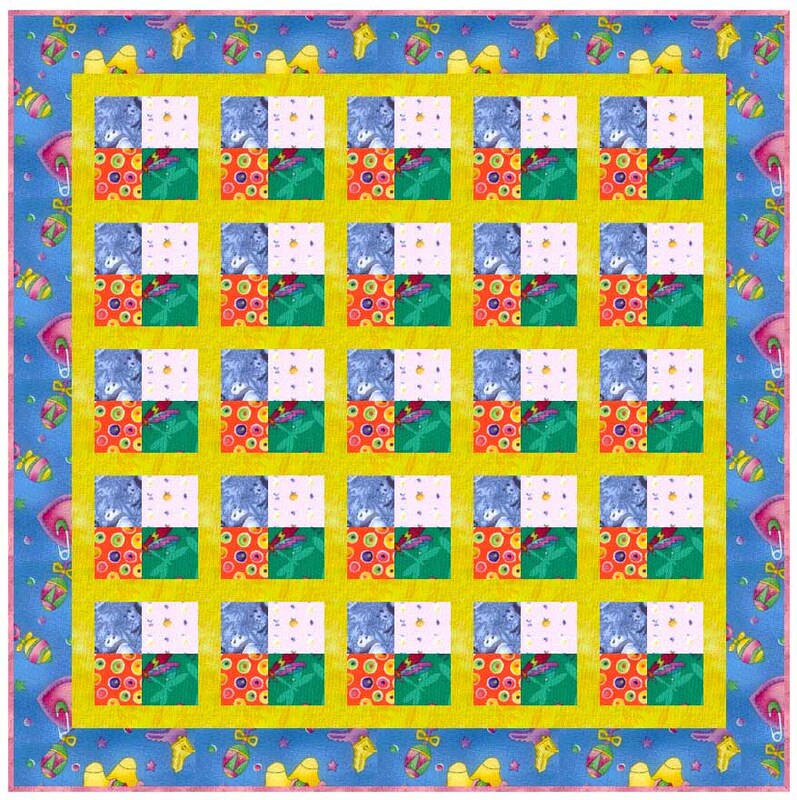 You can view the quilts in our three galleries (100 Good Wishes Gallery, Memory Quilt Gallery, Memorial Quilt Gallery), or other patterns on this page, or anything from a quilt book can be done. If undecided, we are happy to make suggestions for you. What size would you ideally like the quilt to be? (some patterns can be resized to achieve the size you want). What fabrics would you like to include, are you selecting and purchasing the fabrics, or would you like Original Quilts to do the fabric selection? Once the quilt is pieced, it is layered with the back of the quilt and the batting then quilted between all three layers. What type of quilting would you like? Many times the quilting pattern is obvious after looking at the fabrics selected. Quilting is another dimension to a quilt that most people don't think about. It can fall back into the design and not be as noticeable, or it can stand out depending on the design or thread color used. Most clients leave it up to Original Quilts to determine the type of quilting. What type of feel would you like the quilt to have? There are many types of battings to choose from, polyester fill battings, warm and natural battings, etc. Your local quilt shop can show you the choices. Original Quilts uses Warm & White batting for most of the quilts, but smaller baby quilts may have a lighter poly batting. If you are wanting a 100 Good Wishes Quilt, think about the fabrics you have. How small can each piece be cut and still show the design on the fabric? Would a larger quilt help show the 100 fabrics better? 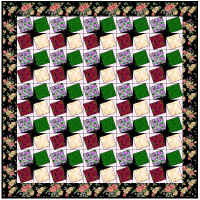 Original Quilts has software to help aid in designing quilts. If you'd like a special pattern or something different and creative, please inquire, and we would be happy to help design something special that fits your design and pricing needs.